I love it when Katz Gluten Free puts out new products. Why? Because it means they are expanding on the line of goodies that I already love and adore. And, trust me, in today’s gluten-free-filled world…quality is what I look for. I’ve been suckered into new products from big companies before only to have a product that tastes like sawdust or something worse. And then…sometimes you get these little known companies that put out the best gluten-free product you have ever tasted. And that medium can rock back and forth. Honestly. Gluten-free foods are more science than anything else. And if the texture or flavor are even the slightest bit off…well…the consumers will make it known. I am a huge fan of Katz Gluten Free. Fell in love with their products from the instant I ordered their free Sample Pack (all you do is pay for shipping!) a long, long, long time ago. Okay…it was probably about two years ago, but still…it feels like I’ve been ordering Katz Gluten Free products my entire life. I was blown away by the standards they maintain and the quality of each product they put out for their consumers and customers. If you’re new to gluten-free foods…I highly suggest ordering this pack…and while you’re at it…order the Gluten Free Powdered Donuts…because…they’re amazing. Just trust me and add it to your shopping cart! Good. Now that that’s done…let me talk to you about one of their newest products! One that I squealed and squeaked and cheered for when I saw the e-mail announcing it to their product lineup. Katz Gluten Free Cinnamon Buns. Like…cinnamon rolls…with the icing already applied. Oh…hell yes!! We all know my weakness for a good cinnamon roll. And finding a good cinnamon roll is not easy when you’re gluten-free. HA…there’s an idea for a Tumblr…”It’s Not Easy Being Gluten-Free.” But I digress. I ordered these the instant they came up as a new product. And then froze them, per instructions, until today. Because it was a gym morning…and I was out of foods that were easy to take to the gym in a cooler to have at the office. These…are easy. And, being that they are a product of Katz Gluten Free…I was pretty certain they’d suffice for a breakfast. I wouldn’t take a bite and wish that I had brought something else. Of that, I was certain. So, last night I removed two of the four buns from the package of Katz Gluten Free Cinnamon Buns, placing them in a plastic bag to thaw. I don’t know why I do this when I know I’m going to microwave the product anyway. I just think it’s easier to get the right temperature when it’s not coming from frozen. So, overnight, they sat and thawed on my counter…and this morning, I packed them in the cooler and hauled my booty to the gym…and then to work. My reward…breakfast that consisted of one of the Katz Gluten Free Cinnamon Buns. My roomie got the other one. One quick 20 second zap in the microwave is all I gave each of these rolls. And it was just what it needed. Because I could have eaten them at room temperature…but you want that fresh from the oven feel, right? I know I do. That’s why I normally thaw them and then give a small zap each time I eat a Katz Gluten Free product. I do the same with the donuts…and OMG! So…I settled in at my desk with my warmed Cinnamon Bun, the icing now all gooey from the quick heating…and that cinnamon filling just ready to be sliced into. I took my fork, gave it a neat cut, and then took my first bite. And this is where it gets complicated. Because I like these. I like these a lot. The only issue I had with them was that the outer part of the Cinnamon Bun was…dry. Yes…even with the icing. It was just…dry. 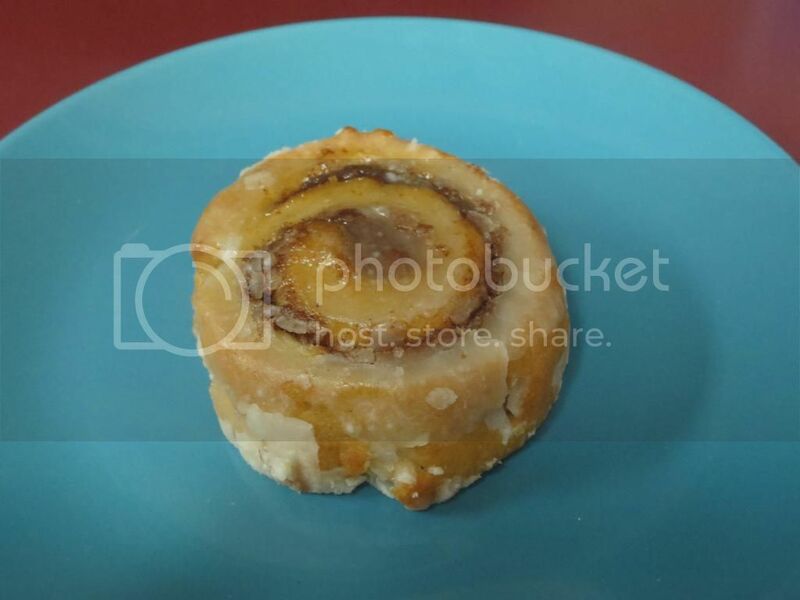 The further you ate into the bun, toward the center, it was moist (and that may have to do with the filling being inside the roll), but that first initial bite just was not the moist and delicious cinnamon roll texture I was anticipating. BUT…that being said…the flavor was awesome. The cinnamon gave just enough spice…the sugar…sweetness…the icing wasn’t too much, but it kept each bite sweet yet satisfying…without taking over and just coating your mouth in sugar, which can happen. It was just a light drizzle of icing, and for that…I was happy. Because…I’m not a frosting/icing kind of girl. I often find it way too sweet. But this was icing perfection. The Cinnamon Bun, itself, had great flavor. And after that first initial twist in the roll, it got a bit moister. It tasted like a cinnamon roll. Maybe a day old cinnamon roll…but that might be due to freezing (you have to keep them frozen as these have no preservatives in them…as is the case with a lot of baked gluten-free goodies), or the microwave, or a flaw in the roll itself. But…I wouldn’t turn my nose up at these. Not at all. I’m already contemplating when the best time to bust out the other one might be. HA! Taste good…a little dry on the outside…but delicious once you get to that inside. YUMMY! So, let’s talk about ingredients. 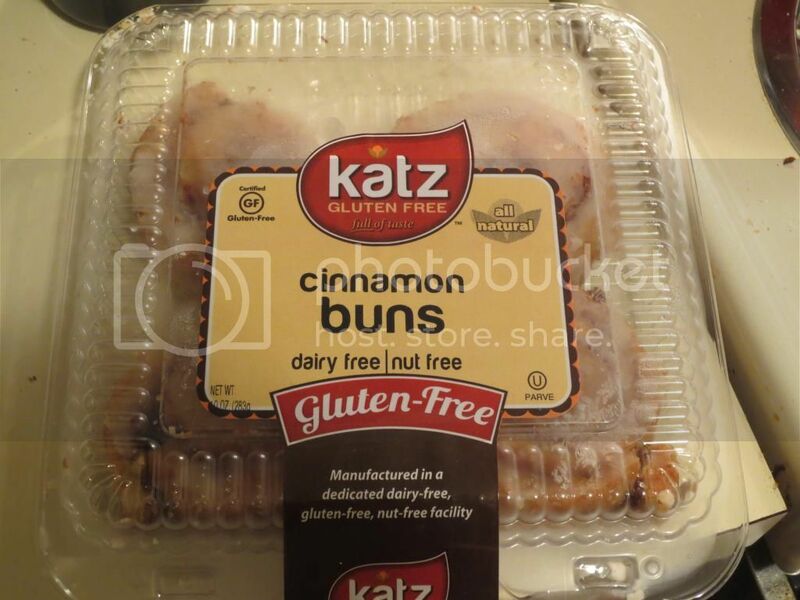 As I mentioned, there are no preservatives added to the Katz Gluten Free Cinnamon Buns. So, they do need to sit in your freezer if you aren’t going to eat them right away. The Katz Gluten Free Cinnamon Buns are made from a gluten-free flour mix (potato, tapioca, sorghum, white rice, brown rice, and corn), trans free margarine, water, sugar, eggs, brown sugar, confection sugar, vanilla extract, cinnamon, dry yeast, honey, xanthan gum, salt, corn syrup, baking powder, sunflower lecithin, emulsifier, nutmeg, canola oil, and orange juice. These Cinnamon Buns are gluten-free, dairy-free, nut-free. As for nutrition…well, it is a breakfast pastry. Yep. Pastry. Which means…sugar, sugar, sugar. It’s true. And while I am trying to cut down on the amount of sugar that I consume…sometimes you just have to have a treat. A serving of the Katz Gluten Free Cinnamon Buns is only one of the rolls. Trust me though…it’s plenty. This one Cinnamon Bun has 280 calories and 15 grams of fat. Yes…15 grams of fat. Pastry. Remember? In addition, you will be consuming 25 mg cholesterol, 110 mg sodium, and 14 grams of sugar. It’s a lot…I know…but not bad for a pastry. These shouldn’t fill you up, considering they contain only 1 gram of fiber and 2 grams of protein…but it kept me going until my morning snack time. So…a solid product from Katz Gluten Free. I was not disappointed with the Gluten Free Cinnamon Buns. They had great flavor. And since it was only the outer ring of the roll itself that seemed dry…well…I can blame that on freezing them…or even reheating in the microwave. Regardless, that small point isn’t enough to prevent me from picking these up again. But…I’d have to really be talked out of ordering the Powdered Donuts. It’s the truth. I love cinnamon…and these definitely hit all the right flavor tones. This entry was posted in Baked Goods, Breakfast, Dessert, Food, Frozen, Gluten-Free, Products, Review, Snacks, Sweet Stuff, Vegetarian by The Celiathlete. Bookmark the permalink.